The northern intersection is a bit odd and rather asymmetrical. It is also clearly very car-centric. By applying our Desire Line tool, we quickly discovered that there are a variety of unconvential ways that bicycle users emply to cross it. Here are the results of our observations. making a right turn down Gammel Kongevej. A majority of the bicycle users (54%) heading out of Værnedamsvej at the north end during the morning rush hour continue straight down Svanholmsvej (Sn). Despite that sounding like a pretty straightforward approach, bicycle users followed three different Desire Lines in this direction. The main trajectory (S3) is used by 90% of the cyclists going straight down Svanholmsvej. Once the light turned green, bicycle users simply followed a straight line across the intersection. The second Desire Line (S2) shows that bicycle users swing to the right in order to follow the crosswalk in order to cross the intersection. The observations didn’t show any obvious reason for this behaviour. We think it is because the intersection is a large expanse of unmarked space due to the irregularities in the layout. Feeling like you are alone in a big empty space may cause bicycle users to seek some structure, like following the crosswalk, in order to indicate to the other traffic users what their intentions are. Some cyclists (5% of all commuters going straight) made a bend to the left (S1). Most of the bicycle users that followed this Line were proceeding faster than normal through the yellow light. They made this bend in their trajectory in order to avoid the cars that had already started off the light on the right on Gammel Kongevej. In conclusion, even though the two streets are not aligned, there are no specific rearrangements to implement regarding this direction. 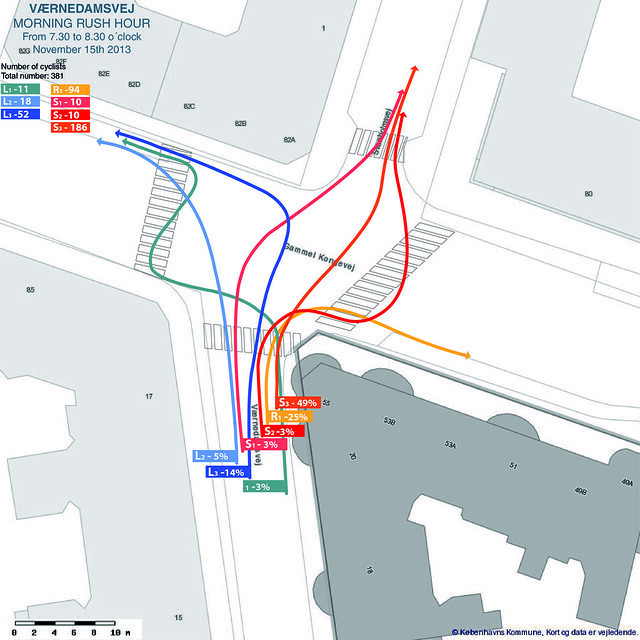 90% of the bicycle users moving from Værnedamsvej into Svanholmsvej follow the simplest, most straightforward trajectory across the intersection. The map shows that 21% of the cyclists leaving Værnedamsvej made a left turn up Gammel Kongevej, following three different Desire Lines. Usually when people in Copenhagen make a left turn at an intersection, they perform the so-called “Copenhagen Left” - or box turn. This involves crossing the intersection and waiting ahead of the crosswalk to continue to the left. At this location, because of the crooked design of the streets, Vœrnedamsvej isn't on a direct axis to Svanholmsvej, bicycle users avoid the unnecessary detour and make a direct turn. 64% of all people turning left aim for the corner of the street, which is the direct line (L3). This seems like the most logical route to take, except that the bicycle users end up crossing the flow of car traffic. There is nothing at the intersection to communicate with the motorised vehicle drivers - like blue bike lanes on the ground. 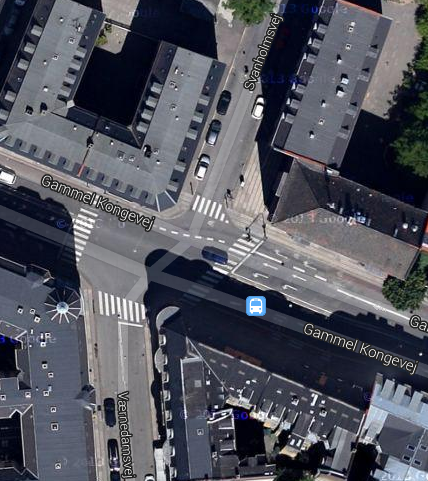 The 22% of all bicycle users making a left turn onto Gammel Kongevej (L2) appeared to have a higher speed than most other cyclists. This appears to cause them to ‘cut corners’. The trajectory L1 shows people using the crosswalk on the left. This often happens when bicycle users arrive at the intersection when the pedestrian light is green. They directly cross Gammel Kongevej by acting as a pedestrian: slowing down to pedestrian speeds or swinging one leg off and proceeding like a scooter. Once again, we are convinced that this behaviour is due to the size and vagueness of the intersection, causing them to seek structure. In conclusion it is, in this situation, complicated and unlikely that we can force the cyclists to make the usual Copenhagen Left. Making a direct turn is quite safe, but the coordination with the cars can be improved. 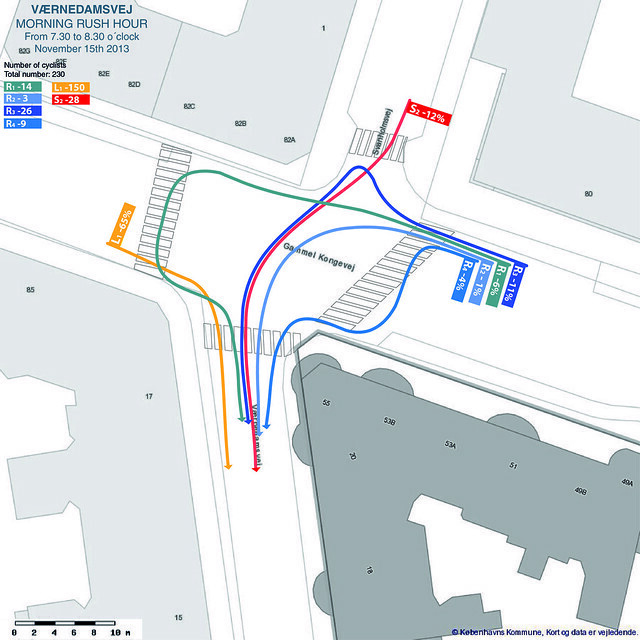 25% of the bicycle users who leave Værnedamsvej turned right on Gammel Kongevej. They followed the traditional Desire Line for right turns and this trajectory does not call for any remarks. There is the question of turning right on red, however, which the police in Copenhagen will not allow, even though it is a bicycle-friendly feature in Paris and other French cities, Basel and many Belgian cities. As we often see, bicycle users turned right on red at this intersection, doing so slowly and always prioritising pedestrians. All very undramatic. 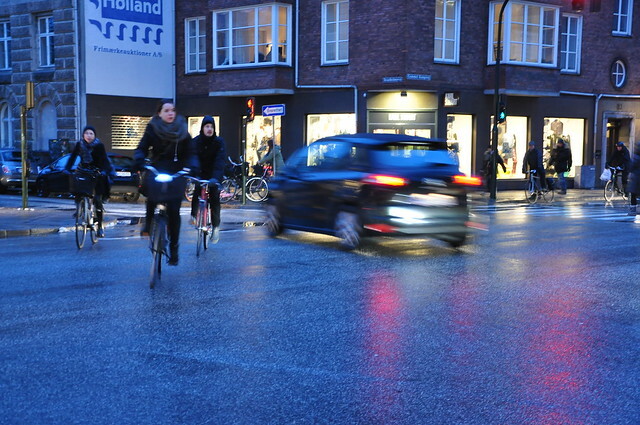 The majority of all bicycle users turning into Værnedamsvej made a right turn from Gammel Kongevej (65%). The people entering the street from this direction used the Desire Line Ln. This route does not show any complications. Only 12% of bicycle users entering Værnedamsvej come from Svanholmsvej (Sn). Svanholmsvej is a one-way street for all traffic (south to north) but it is often used by cycling citizens in both directions. Bicycle users who come out have to wait at the corner of Svanholmsvej and Gammel Kongevej. It is not an official waiting area for cyclists doing the Copenhagen Left, which is obviously an oversight by the City of Frederiksberg. Because the sidewalk is extended here, and the street is narrow, there is not a lot of space for waiting bicycle users. 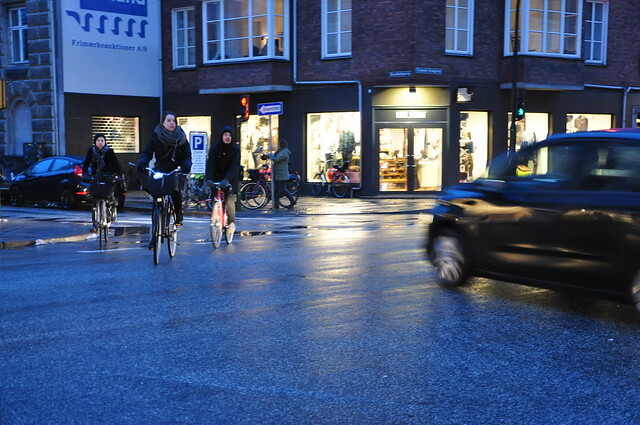 Also, there is no traffic light for bicycle users wishing to go down Værnedamsvej. This lack of space causes a conflict between the waiting bicycle users and cars entering Svanholmsvej. It is unclear to all traffic users what the hierarchy is here, with no clear markings. Bicycle users waiting at Svanhomlsvej corner and using the pedestrian crossing light to know when they must cross the boulevard. 23% of people turning into the Værnedamsvej turn left from Gammel Kongevej. The map shows us that there are four different ways to take this route. At this intersection, the important point to figure out was how many bicycle users perform the Copenhagen Left to cross this intersection? In fact, 50% did so, by waiting at the corner of the Svanholmsvej for the next green light. Fewer people (27%) use the crosswalks – either the first or the second one - to get across Gammel Kongevej when the pedestrian light is green. There is a very small number of people who directly cross the entire intersection. This is only done when there is a gap in car traffic and the passage appears safe. Generally speaking, the data collected during the afternoon rush hour show the same Desire Lines but the proportions are different. 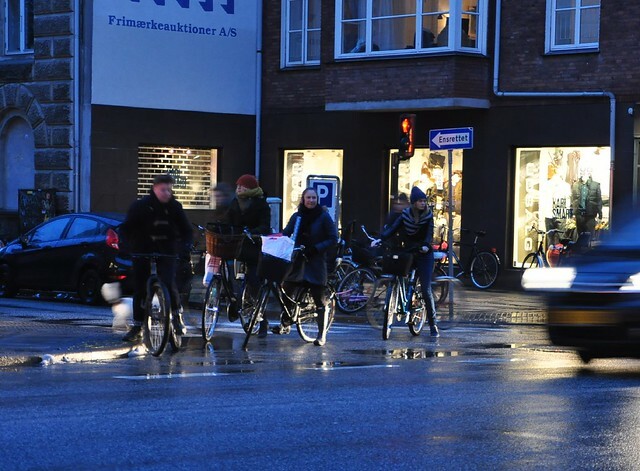 First, the Copenhagen Left is a major and effective feature of the cycling habits in the city - as well as being the law – and few cyclists bother to cross an intersection directly. When the streets are not aligned it remains an habit for half of the cyclists to do the Copenhagen Left even if no bike box is painted on the ground. Secondly, at the corner of Svanholmsvej and Værnedamsvej the space is too narrow to accommodate the number of cyclists waiting. It creates a potential conflict with the cars. Stay tuned to discover the Copenhagenize Fixes resulting from these observations. Many thanks to Leike, Dutch intern at Copenhagenize Design Co. for her hard work.